Despite advances in navigation devices, such as global positioning systems (GPS), depth sounder, and even radar, it seems we aren’t immune to fatal errors. During the day on January 13th, 2012, in calm seas and overcast weather, the 114,137 GT Costa Concordia cruise liner sunk in the Tyrrhenian Sea. This incident highlights the importance of navigational aids. Certainly, if someone has radar, depth sounder, or a GPS, it would be possible to find the exact coordinates of the ship, and even what’s underneath it or in its vicinity. But one cannot tell what’s ahead in or under the ocean water. For this purpose, it’s necessary to rely on navigational aids, lighthouses, lights, and/or horns to mark the waterways to ensure safe navigation by sea. Comparing the end of the 19th century to today, the increase of watercrafts is mind-boggling. In 2013, there were 12 million recreational vessels registered in the United States. Beyond that figure, it’s not possible to accurately estimate how many watercrafts exist in the world. If one was to make a distinction between boats and/or ships sailing further than 100 miles from the coast, the number of those is more than 100,000. The large majority of the boats/ships operate near the coast, which is the most dangerous place, primarily due to underwater rocks—which is the reason the Costa Concordia cruise liner sunk. Navigational aids help mark a safe path for boats/ships to pass, independent of the ebb and flow of the tide. On land, electricity is generally available to power warning lights. On the waterways, however, that’s not possible, and so navigational aids are relied on to assure the safe passage for ships and boats. Around the turn of the 20th century, many lighthouses and buoys used dangerous and expensive acetylene gas, generated in situ from calcium carbide and water to produce light. After that, electricity was used for lights and horns, and was provided by either diesel engines or batteries. But servicing these lights and horns proved very expensive. With advancements in renewable energy, the availability of solar power became an ideal solution to provide electricity—and not only for on-land purposes. As many as 13,000 lighthouses and many tens of thousands of navigational aids presently existing in the world to aid those out at sea. There are also large numbers of structures—most of them related to oil—which have to be marked by navigational aids. The US Coast Guard (USCG) alone probably has at least 5,000 navigational aids. In 1973, USCG Lieutenant Commander Lloyd Lomer (retired) had the idea that using solar cells to power navigational aids, buoys, lighthouses, and other navigational aids would save the USCG money. By decreasing the service of buoys and lighthouses, wherein the battery went dead or the diesel engines needed servicing or fuel, savings could be made. Despite the cost-saving benefits solar cell modules presented, Lomer also knew the Coast Guard’s navigational aids could not fail. The buoys and the solar modules attached to them are exposed to an unforgiving environment, including: hot and/or cold salt water and salt water spray; UV radiation; humidity; extreme rain; snow and ice; hail; wind storms; and even birds—which love to build nests on buoys. The solar systems Lomer envisioned were to be utilized for the Gulf of Mexico, as well as for in waters where there is ample ice and snow. Ships in treacherous waters rely on navigational aids, and if even one of them fails to function, it could even cause serious damage to the ship and loss of life. 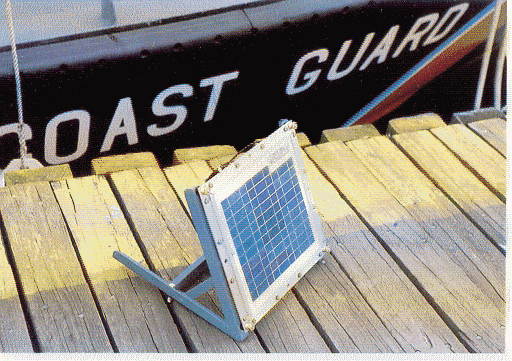 Once Lomer was satisfied solar navigational aids could successfully endure the strict USCG requirements—proving reliable under the harshest conditions at all times—USCG navigational aids were converted to solar electric power (see Image 1). A flashing light, located in Chesapeake Bay off the east coast of the United States, demonstrates the cost savings of implementing solar electricity in navigational aids. The savings isn’t only due to the decreased battery maintenance (it doesn’t have to be changed periodically), but also because of the battery size. As a smaller battery is sufficient in this case, the entire structure is much cheaper. The solar modules here were also equipped with “bird wires,” intended to discourage birds going near the modules. The very first solar powered lighthouse in North America was installed at False Duck, Ontario. At present, after 33 years of service, the original four (30 Wp) solar modules are still operating the lighthouse. 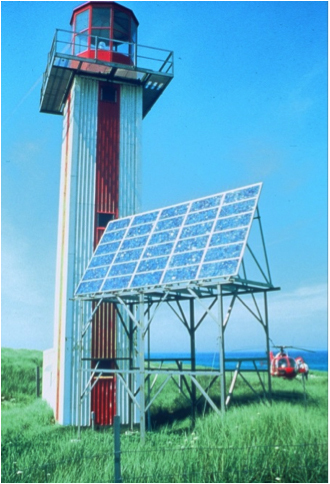 Canada started deploying solar powered navigational aids before the US Coast Guard began. The main reason was that the introduction of PV power to the US Coast Guard’s navigational aids was made technically more complicated due to the environmental conditions. Overall, the waters with which the Canadians were concerned posed much fewer challenges than in the US. They still had to deal with cold salt water, snow, ice, hail, and windstorms. However, hot salt water wasn’t an issue, and neither were hard UV radiation or extreme humidity like in the US. This made a big difference in specifications. As failure was not an option, the PV modules for the US Coast Guard required more protective encapsulation for the solar cells and their interconnections than the modules for their Canadian neighbors. Nevertheless, the savings maintained by utilizing solar energy to charge the batteries in navigational aids for the Canadian and US Coast Guards have been substantial. When contemplating solar power, it’s likely most people imagine an area robust with sunshine…perhaps somewhere such as Arizona or the Sahara. However, solar-powered navigational aids have been successfully installed in overcast, storm-ridden regions. The northern-most, PV-powered, navigational aid installed by the Canadian Coast Guard is at Resolute Bay. It’s located about 150 kilometers from the magnetic North Pole of the earth. This navigational aid was installed back in 1981, and is still in operation today. Sabel Island, Nova Scotia, is also home to a lighthouse that’s operated by a 1.2 kW PV system, showcasing that solar modules can be used in much less sunny, northern parts of the world (see Image 2). Today, the conversion of navigational aids powered by solar PV continues to be done all over the world—despite weather and water conditions. For more information on the revolution caused by the utilization of solar electricity, read Peter F Varadi’s book, “Sun Above the Horizon – Meteoric rise of the solar industry” (Pan Stanford Series on Renewable Energy; 2014 | www.crcpress.com). This book details the history of the PV industry, including its affect on 100-year-old electric utilities, the government, large corporations, and on people. It guides readers on how photovoltaic’s became a powerful force in electricity generation and how solar energy will affect the future. It’s available at http://www.amazon.com. Dr Varadi was co-founder of Solarex, which was one of the two PV companies that first started the terrestrial PV industry in 1973. In recognition of his lifelong service to the global solar industry, Dr Varadi received the European PV Industry Association’s (EPIA) John Bonda prize (2004).